For UN Members' $18 M in Parking Fines, Ban "Is Not Responsible"
UNITED NATIONS, January 12 -- With the New York media buzzing with news that member states' missions to the UN owe over $18 million in unpaid parking tickets, Inner City Press on Tuesday asked if Secretary General Ban Ki-moon has any guidance to the UN's members on whether they should pay. Mr. Ban's spokesman Martin Nesirky responded that "the Secretary General is not responsible." Video here, from Minute 27:06. Inner City Press had prefaced the question by saying that while the UN Secretary General is not a member state, he is the world's chief diplomat, and stands between the UN member states and the host country and city. The UN preaches around the world about the rule of law, but won't even recommend that its member pay their bills in the UN's home city. Even practically, with the U.S. being the largest donor to the UN as well as the Permanent Five member of the Security Council which most recently ignored the cautions and non-approvals issued by that body, it would seem a key part of a UN Secretary General's job to improve the image of the UN and its member states in the view of residents of the home country and city. 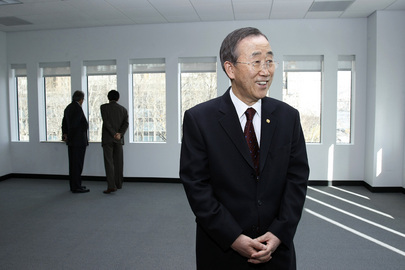 Mr. Ban's spokesman Martin Nesirky pointed out to Inner City Press that at the previous day's ribbon cutting for the UN's Wal-Mart like temporary building on the North Lawn on 46th Street and 1st Avenue, New York City was represented. 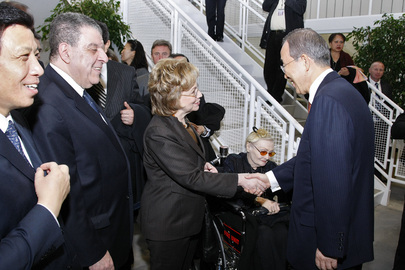 UN's Ban with NYC's Marjorie Tiven, $18 M in unpaid tickets not shown - or raised? The top three deadbeats are Egypt ($1.9 million), Kuwait and Nigeria, which is also accused of failing to pay real estate taxes on commercial parts of its "Nigeria House" building on 44th Street and Second Avenue. Also in the top ten deadbeats, all over $400,000, are Indonesia, Brazil, Morocco, Pakistan, Senegal, Sudan and Angola. We will have more on this -- watch this site.